… marriage equality in New York !!! Nice rings. Are you guys married? ALLISON: We’ve been married three times; we had one on an island off St. Martin, one in New York, at Battery Gardens, and one in San Diego, where Simone’s parents live. That was the only one that was technically legal. 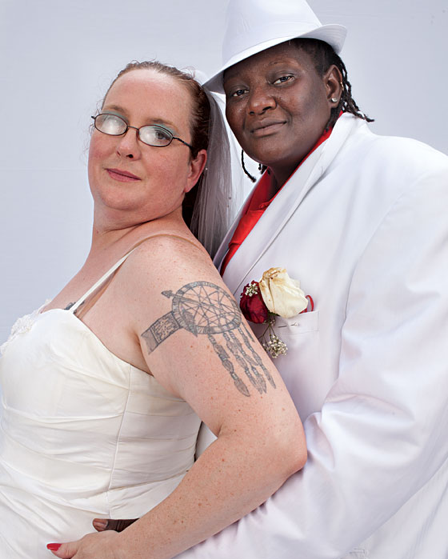 Oh, and we’re thinking of going up to Connecticut soon to do a double- gay wedding with friends. ALLISON: Well, we wouldn’t have done it so many times if we could do it legally in New York. Do you feel angry about Proposition 8’s passing in California? SIMONE: I did. It had been five years, and it was time for me to do something, or I was going to get in trouble. Allison’s a traditional Jewish girl at heart—she wanted the ring, the big wedding, she wanted everything. ALLISON: I got nervous, I felt sick, and then I screamed like a little girl. Did either of you ever fantasize about your wedding as a kid? ALLISON: Sure. And just because you realize you’re gay, it doesn’t change those dreams. But I always knew I wanted to wear a suit instead of a dress.